Home » Termite Control » Is That Termite Damage? Termites are called “silent destroyers” for a reason – often times you won’t know you even have termites until the damage has already been done and you’re looking at a bill for the repairs. Since termites cause billions of dollars of damage every year, it’s important you know the damage signs to look for. The type of damage you see will often determine the type of termite you are dealing with. There are two common species found in Arizona: Subterranean and Drywood. While both of these species are pesky, they do cause very different types of damage. We’ll outline the damage below. Subterranean termites live underground, making their nests in loose and damp soil. From their nests they burrow up through your foundation, right into the structural supports of your home. Damage to look for includes buckling wood and sagging or swollen floors or ceilings. The damage will often look like water damage. If you see this type of damage, it behooves you to take a closer look and call a termite control professional that can help make sure you aren’t dealing with termites. 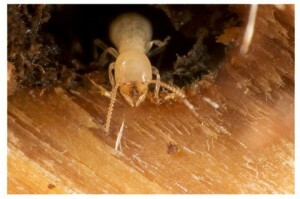 Drywood termites build their homes directly in the wood they feed on. As they move through the wood, they create galleries of mazes, thus causing wood to sound hollow when knocked on. They can cause cracks as a result of this habit of burrowing deep into wood. Also, if you are dealing with a dry wood termite infestation, you might find little pebbles of feces called “frass.” This gets left behind as the termites chew through the wood. Little piles of this might indicate you have a dry wood infestation. If you notice any of these signs, you should contact a termite control professional.